Most companies strive towards continually improving and fine-tuning their distribution methods. Safety and efficiency of delivery methods can have a significant impact on the overall profitability of a business. Therefore, integrating the most current and effective delivery methods, tools and practices is key to maximizing profitability. This includes everything from maximizing load capacities to ensuring that loading docks are efficient and safe throughout the entire delivery landscape. Loading docks have inherent dangers that can pose considerable risk to delivery personnel. Copperloy has made it our mission for over 60 years to engineer the safest and most efficient systems for our clientele. We understand the catastrophic effects that workplace injuries can have on employees and businesses alike. Having yard ramps that are sized appropriately to a dock’s particular space requirements and equipment specifications can reduce many risks associated with poorly fitted ramps. Enabling delivery personnel to move more efficiently through their delivery process by utilizing the benefits of extra large yard ramps, saves considerable and valuable time and thus increases the overall profitability of your business’ bottom line. At Copperloy, we understand the dramatic effect that increased efficiency and enhanced safety has on a company. Speeding up the delivery process through these measures can help to maximize the success of your business. Copperloy yard ramps are constructed with steel serrated grating, providing increased traction and durability. This also enhances efficiency and safety in inclement weather as it allows for snow and rain to fall through, leading to less risk to your delivery personnel. Our yard ramps feature a capacity that ranges from 16,000 to 60,000 pounds, 36-feet long, and are available in widths of either 70 or 84 inches. A hydraulic pump can adjust yard ramp height, allowing for 37 to 65 inch heights. Our Copperloy yard ramps also help to prevent runoff with steel side curb features. Many ramps are ANSI compliant. Often at Copperloy, we find that our customers run into delivery issues or problems because the design elements of their loading docks were not created to anticipate the future evolution of their manufacturing and production needs. Docks often have schematics that are not able to accommodate standard delivery. Insufficient approaches, small doorways, excessive slopes, gravel approaches, improper bumper projections, and docks that are too low. Copperloy can help you plan ahead so you can avoid hefty remodeling costs down the road. These include knock out panel walls and building docks to suit industry standards or anticipated changes and expansions can save your business considerable time and money. At Copperloy, we have an in-house engineering team and manufacturing facility that is able to custom manufacture yard ramps for almost any size and capacity requirement that you may have for your business. We invite you to call us for a professional consultation to discuss your special requirements and requests. Call a Copperloy specialist today at 800-321-4968. Copperloy is the industry leader for high quality yard ramps of all kinds. Whatever you need, we have you covered. But what exactly do you have in mind? 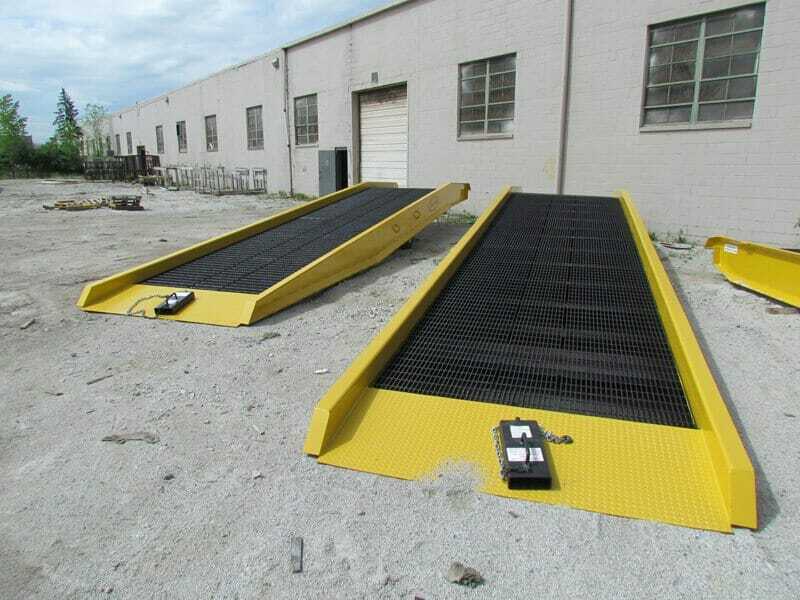 What’s the correct yard ramp for your business and facility? Of course, there’s no single perfect solution, instead, you have to narrow down your choices and find the best match for your specific needs. The first question to ask yourself is if you’re looking for a yard ramp to go from a truck bed to the ground, or from dock level to the ground. This tells you right away whether you should be looking for a mobile yard ramp or a dock to ground ramp. Next, consider the way you’ll be using your ramp, and the specifications you need. When it comes to capacity, be sure to consider the combined weight of your forklift or other equipment, in tandem with its own maximum load. For sizing, take the measurements of your facility and any necessary structures or other equipment utilized. There are multiple specifications to be concerned with, including the overall length of the ramp, its usable width, as well as its overall width, its functional height range, and even how much it weighs. Also ask yourself, should you be buying new or used? Should you even be buying, or should you be renting? It all depends on the flexibility you’re looking to have, as well as your potential future needs, changes to your business, and of course, how much you’re willing to spend now. If you have any questions about our current yard ramp lineup or if you need assistance narrowing down the selection and choosing the perfect ramp for your facility, then call the Copperloy team at 800-321-4968“>800-321-4968 today.